I’m a firm believer that the best time to catch a restaurant at its prime is not when its already been showered with buckets of accolades, but when its still hungry as hell… chasing for that first elusive Michelin star. 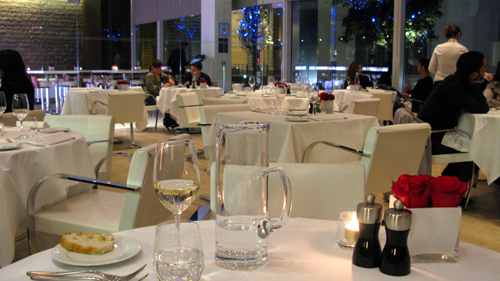 Many were surprised when Michelin failed to award L’Anima’s Francesco Mazzei his first star earlier this year. After a near flawless dinner there I can certainly see the injustice. Mazzei’s food is Southern Italian cooking at its absolute best. The produce and ingredients are superb and he successfully blends the raw simplicity which defines Italian cuisine with some deft, comtemporary flair which elevates his food to that next level. 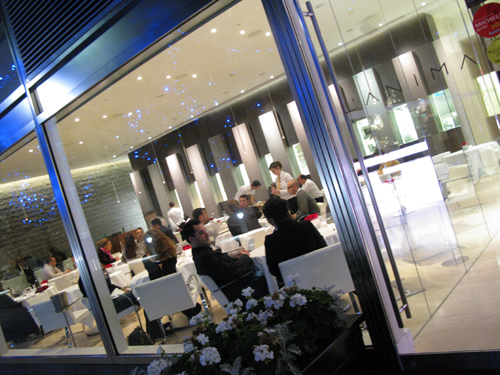 Given its proximity to Bishopsgate, much of L’Anima’s weekday clientele are the inevitable smug, well-heeled, SavilleRow City type. Thankfully though, after a long week in the office, it was a much more informal, laid-back affair on the Saturday night we visited. No cufflinks or Corporate Amexes in sight. Only the snow-white table linen, red roses and dangling wand-like downlighters of L’Anima’s minimalist dining room. 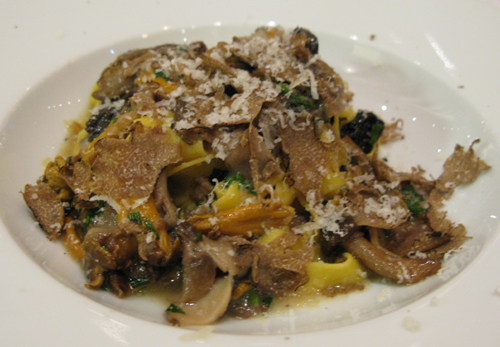 The Wild Mushroom and Black Truffle Fettucini I kicked off with was first-rate. The earthy-jus of the porcini and ceps formed a beautiful light pasta sauce which was turbo-charged by the richness from the black truffle shavings. 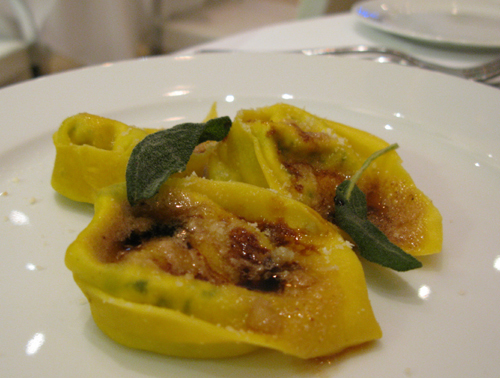 The stunner of the evening though was no doubt Jo’s Tortellini. Velvety-smooth egg pasta parcels wrapped the gift of a delicate, moist Ricotta and herb stuffing. Perfectly accompanied with deep-fried sage leaves and finished off with a few drops of precious, premium-aged Famiglia Gottardi Balsamic Vinegar which binded the flavours together perfectly. Absolute bliss… I still dream about going back and ordering a main course portion. Onto the main event. 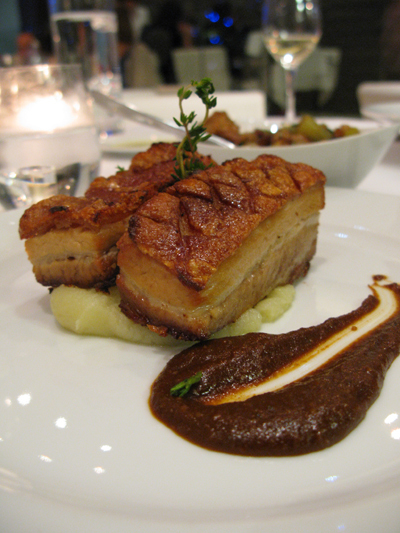 Jo’s Slow Roasted Black Pig Belly had the perfect crunch to its crackling and was served with a tangy, paprika and honey-based N’Cantarata sauce. Only complaint though was that the overall dish was a tad dry and it could have done with more sauce or a gravy to moisten the mash. My fish stew with bass, prawns, clams and mussels was serious comfort food for the chilly Autumn night. 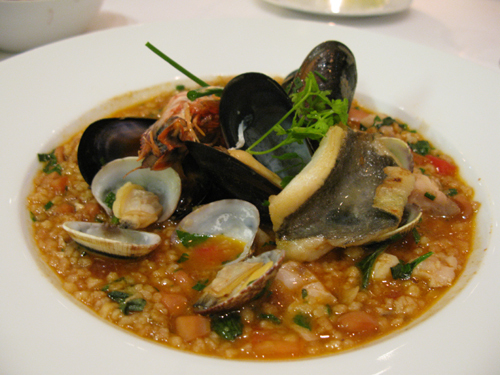 The cous-cous-like Fregola which soaked up the sweet, saffron and tomato seafood broth was a delight. I had difficulty stopping myself from lapping up every single drop off the bowl. I’m starting to run out of superlatives here, but do save some room for one of L’Anima’s quite sublime desserts. 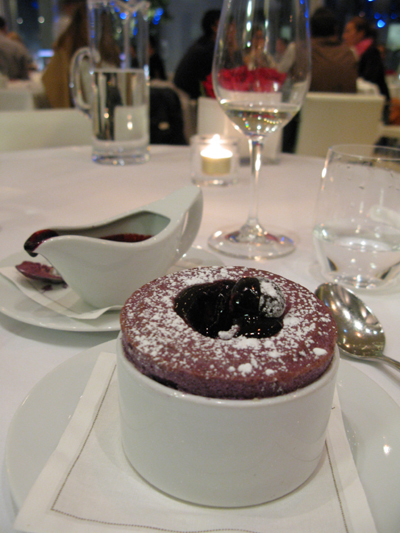 Watch in awe as one of the waiting staff pour a gorgeous blueberry sauce right into the heart of an airy, perfectly risen soufflé. 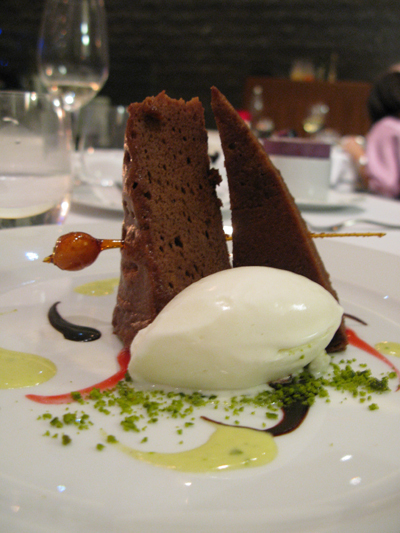 It is to die for… The beautifully plated Gianduja cake with Fior di Latte ice-cream is also very, very good. Light as a feather, its like eating through cloud of chocolate and hazelnut..
Zafferano’s, Locanda Locatelli and the other Italian one-starrers in London should make way. There is a new star in town (Michelin just haven’t woken up to that fact yet).